Just another laid-back look. I didn't sleep at home so I didn't get to bring enough clothes such as blazers for the finishing touch. Forgive me for the quick outfit shots and for mixing florals, aztec and metals together. What a fashion crime. Only an hour before going to Davao Memorial Park. Cramming everything into a perfect day of fun-filled all saint's except traffic and the C.R. issues. I really love your shorts and shoes. <3 Happy Friday! Love all those pieces - and I can't believe most of them are thrifted! Great finds. Following you back on GFC and Bloglovin. Cute look! I love your shorts! Thanks for visiting my blog and the follow!! I'm already following your blog!! Hi sweety, you have the prettiest blog! Following you as well. This is adorably styled outfit, great floral top and adore the brogues! You're so adorable! Nice outfit. Wanna follow each other? Cute look. Love your style!! omg I love your leather shorts! This look rocks but what I like the most are the shoes, amazing! Awww.. cute shoes! And the yellow color is so unique!!! Love love love it! Cute outfit! i am in love with your shoes! you have such a great sense of style! Great outfit! I love your blog and I am now following you! Love the texture of your shorts. great collar necklace!! Love the look of the shoes with the leather shorts! 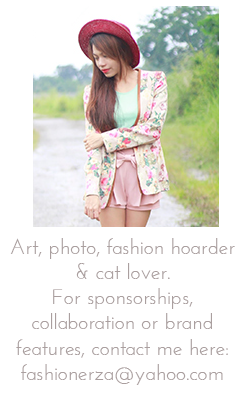 Love your blog so much ♥ maybe wanna follow each other? Amazing look!!! Love especially your shades and shoes :) A new follower, stay in touch!!! Love those shoes. Thanks for following me. Following back on GFC.Do you want to follow each other on bloglovin too? Let me know will follow back. Hi, thank you very much for the lovely comment, your blog is wonderful!!! I love the color and the graphic!!!! Beautiful outfit, love the collar, the bracelet and the shorts in leather *.*!!!!!!!! oh and you have an awesome blog here! lovinggg everything... definitely following you back!! thanks for your lovely comment , following you back with pleasure sweetie . I love this blog! Great post! I hope you can follow back. :) Xo xo! It's such a great combination!!! I Love!! Love your shorts and accessories! I'm now following you too, thanks! Kisses! Cool pics, I like your style! Thanks for the sweet comment on my blog and for following! I'm following back! YOu have great style! Hello thx for de comment on my blog and the follow! I really like youre blog. I'm following now! Thanks for the comment on my blog lady! You have such cute style!! I am now following! I'd love for you to check out mine! This is a great outfit! Thanks for your comment, I'm following you back now.